. The laser is a device which amplifies the light, hence the LASER is an acronym for light amplification by simulated emission of radiation. The operation of the device may be described by the formation of an electromagnetic standing wave within a cavity (optical resonator) which provides an output of monochromatic highly coherent radiation.
. Material absorb light rather than emitting. Three different fundamental process occurs between the two energy states of an atom. 1) Absorption 2) Spontaneous emission 3) Stimulated emission.
. Laser acting is the result of three process absorption of energy packets (photons) spontaneous emission, and stimulated emission. (These processes are represented by the simple two-energy-level diagrams). Where, E1 is the lower state energy level.
. Quantum theory states that any atom exists only in certain discrete energy state, absorption or emission of light causes them to make a transition from one state to another. 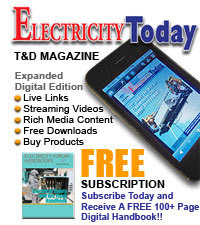 The frequency of the absorbed or emitted radiation f is related to the difference in energy E between the two states. If E1 is lower state energy level. and E2 is higher state energy level. E = (E2 – E1) = h.f.
Where, h = 6.626x 10-34 J/s (Plank's constant).
. An atom is initially in the lower energy state, when the photon with energy (E2 – E1) is incident on the atom it will be excited into the higher energy state E through the absorption of the photon.
. When the atom is initially in the larger energy state E2, it can make a transition to the lower energy state E providing the emission of a photon at a frequency corresponding to E = h.f. 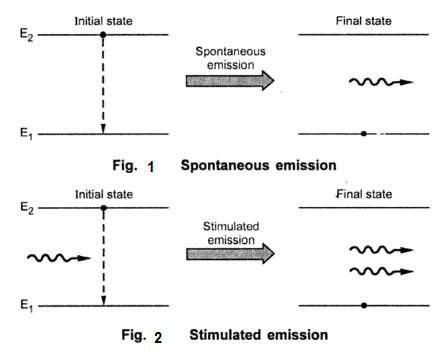 The emission process can occur in two ways. A) By spontaneous emission in which the atom returns to the lower energy state in random manner. B) By stimulated emission when a photon having equal energy to the difference between the two states (E2 – E1) interacts with the atom causing it to the lower state with the creation of the second photon.
. Spontaneous emission gives incoherent radiation while stimulated emission gives coherent radiation. Hence the light associated with emitted photon is of same frequency of incident photo, and in same phase with same polarization.
. It means that when an atom is stimulated to emit light energy by an incident wave, the liberated energy can add to the wave in constructive manner. The emitted light is bounced back and forth internally between two reflecting surface. The bouncing back and forth of light wave cause their intensity to reinforce and build-up the result in a high brilliance, single frequency light beam providing amplification.
. If N1 and N2 are the atomic densities in the ground and excited states. A, B and B' are constants.
. Under equilibrium condition the atomic densities N1 and N2 are given by Boltzmann statistics.
. Under equilibrium the upward and downward transition rates are equal.
. A and B are called Einstein's coefficient. Light propagation along the axis of the interferometer is reflected by the mirrors back to the amplifying medium providing optical gain. The dimensions of cavity are 25-500 μm longitudinal 5-15 μm lateral and 0.1-0.2 μm transverse. Fig. 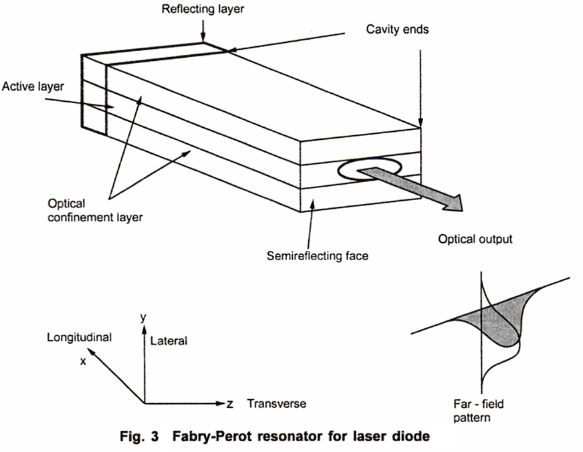 3 shows Fabry-Perot resonator cavity for a laser diode.
. The two heterojunctions provide carrier and optical confinement in a direction normal to the junction. The current at which lasing starts is the threshold current. Above this current the output power increases sharply.
. In DFB laser the lasing action is obtained by periodic variations of refractive index analog the longitudinal dimension of the diode. Fig. 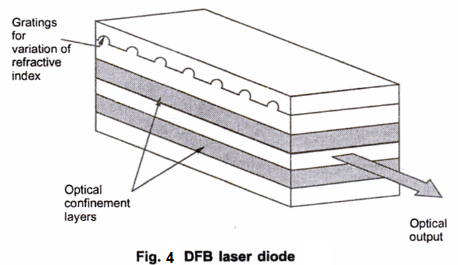 4 shows structure of DFB laser diode. I(Z) is optical field intensity. ω is optical radian frequency. Γ is optical field confinement factor or the fraction of optical power in the active layer. ᾱ is effective absorption coefficient of material. 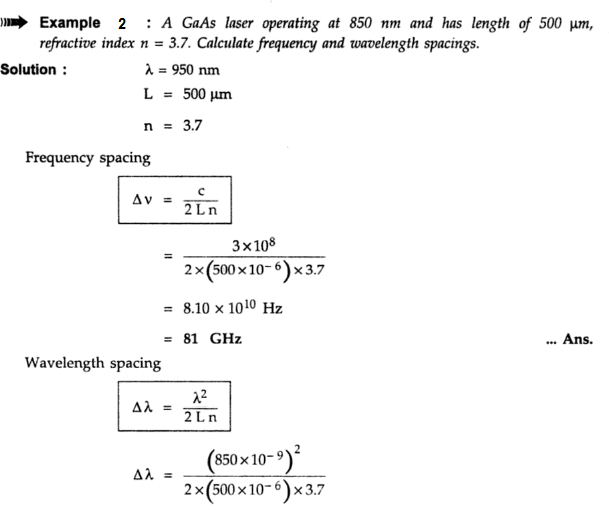 Z is distance traverse along the lasing cavity.
. Lasing (light amplification) occurs when gain of modes exceeds above optical loss during one round trip through the cavity i.e. z 2L. If R1 and R2 are the mirror reflectivities of the two ends of laser diode. Now the expression for lasing expression is modified as . iii) Optical gain at threshold = Total loss in the cavity. αend is mirror loss in lasing cavity.
. An important condition for lasing to occur is that gain, g ≥ gth i.e. threshold gain.
. 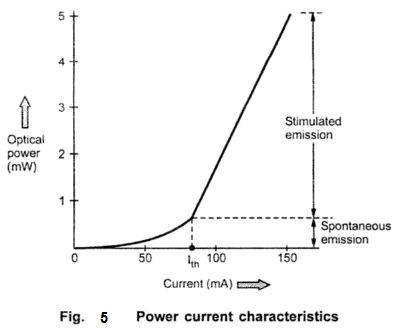 The output optic power versus forward input current characteristics is plotted in Fig. 5 for a typical laser diode. Below the threshold current (Ith) only spontaneous emission is emitted hence there is small increase in optic power with drive current. At threshold when lasing conditions are satisfied. The optical power increases sharply after the lasing threshold because of stimulated emission. Where, β is constant for device structure. ηi = Internal quantum efficiency (0.6-0.7). 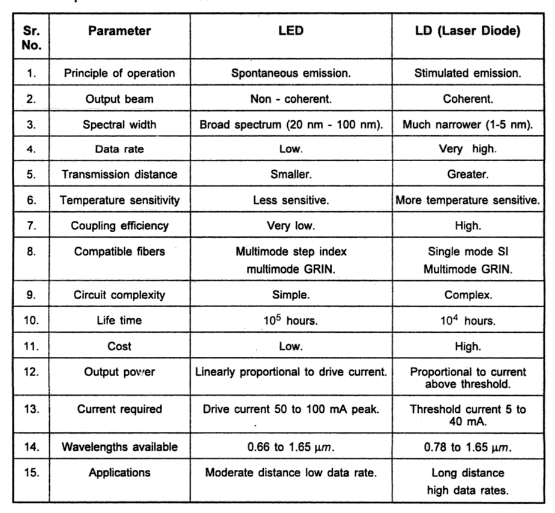 .Typical value of ηext standard semiconductor laser is ranging between 15-20%. λ0 is center wavelength is spectrum. σ is spectral width of the gair.
. The output of laser diode depends on the drive current passing through it. At low drive current, the laser operates as an inefficient LED, when drive current crosses threshold value, lasing action begins. Fig. 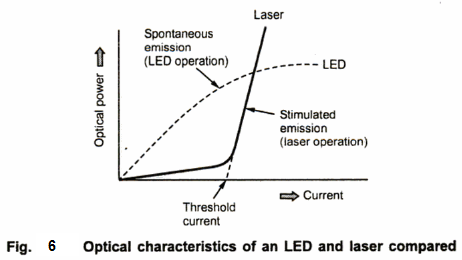 6 illustrates graph comparing optical powers of LED operation (due to spontaneous emission) and laser operation (due to stimulated emission).
. At low current laser diode acts like normal LED above threshold current, stimulated emission i.e. narrowing of light ray to a few spectral lines instead of board spectral distribution, exist. This enables the laser to easily couple to single mode fiber and reduces the amount of uncoupled light (i.e. spatial radiation distribution). Fig. 7 shows spectral and spatial distribution difference between two diodes. 3. Production of light can be precisely controlled. 4. Can be used at high temperatures. 7. Low spectral width (3.5 nm). 8. 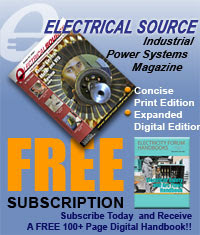 Ability to transmit optical output powers between 5 and 10 Mw. 9. Ability to maintain the intrinsic layer characteristics over long periods. 1. At the end of fiber, a speckle pattern appears as two coherent light beams add or subtract their electric field depending upon their relative phases. 2. Laser diode is extremely sensitive to overload currents and at high transmission rates, when laser is required to operate continuously the use of large drive current produces unfavourable thermal characteristics and necessitates the use of cooling and power stabilization.